Bitumen Emulsion Sprayer. We are one of the leading manufacturers and exporters of bitumen emulsion sprayer that is offered in various ranges and specifications. Bitumen Emulsion SprayerWe can also be used with weed and pest control preparations. This unit offers all the features of the power operated sprayers plus a highly efficient engine-driven compressor that ensures vacuum and pressure cycles are able to be operated in a minimum time. This bitumen emulsion sprayer is equipped with a dust remover for a better result. The process of surface treatment is possible only with the help of this bitumen emulsion sprayer. 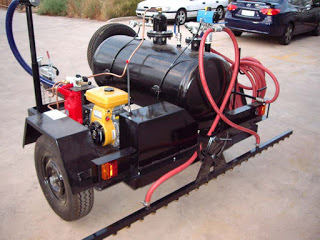 These sprayers are mainly used during road construction work it spray bitumen or emulsion on road ranging from 500 ltr to 12000 ltr, trolley mounted and truck mounted. 1 Response to "Bitumen Emulsion Sprayer"